As well as being Canada's first medical library, McGill's Health Sciences Library was the first in Canada to gain access to Medline, the computer-based system developed by the United States National Library of Medicine, giving students, clinicians and researchers speedy access to information contained in the journal literature. In 1973 Medline indexed information on articles in about 1,200 of the most significant journals in medicine and now offers access to over 3,500. Through an agreement with the National Science Library of Canada and a generous grant from the McConnell Family Foundation, McGill was able to install a Medline terminal on February 19, 1973. Looking back it was extraordinarily slow, the terminal was huge and noisy and, because cross-border data exchange was not possible, a regular telephone line to Plattsburg, New York connected it to the National Library of Medicine in Washington. It was a breakthrough, however, and users from many faculties soon took advantage of the service. 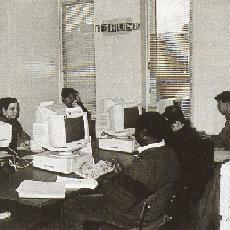 These days, McGill offers access to Medline and many other data bases through the PERUSE system and over the Internet. Today, students and researchers benefit from a host of databases in many fields; some are indexes and abstracts, others are full-text journals and textbooks and others are data files. Though it has never been possible to own "everything" the advent of technology and much more reliable communications has placed the emphasis on access rather than on ownership, on providing information just in time rather than just in case. Nevertheless, the collection now totals 260,000 volumes, we teach faculty, staff and students how to use the Internet effectively, we answer 32,000 reference questions annually, and our circulation numbers reach 60,000. In fifty years time we will be as different as we are now from the first Library of 1823, but the aim will be the same: to provide McGill's staff, students, clinicians and researchers with up-to-date medical and scientific information, as quickly and efficiently as possible.